Beth Hart triumphantly returned to the Ryman Auditorium in Nashville, Tennessee on March 10, 2017. A capacity crowd filled the pews of the Mother Church on Friday night. The stage was filled with gear and candles as music was piped in prior to Beth strolling out to cheers. Tonight she was wearing a sparkly, short dress. She opened with the feisty "Let's Get Together" from her recent release Fire On The Floor followed by a bluesy and bold "Sinner's Prayer" that earned Beth and her talented band one of many standing ovations of the evening. Beth Hart brought tales of redemption and authoritative rock to the Mother Church. Ms. Hart a California singer, songwriter and multi-instrumentalist gave a fiery and heartfelt concert in Music City last year. Thus, her return to the Ryman was much anticipated. Beth rose to the occasion with a show that reflected her private life and her power in the live setting. Much of Hart's artistry has come from agony and heartbreak along with happiness and hope. Beth is bipolar which led her down dark paths that included institutions and re-hab. With the help of her husband Scott Guetzkow who is also her road manager Hart is now a story of revival both personally and professionally. Taking a page from her occasional co-collaborator Joe Bonamassa Hart is a prolific writer with albums coming out annually. Word on the street is that Joe and Beth will be back in the studio soon. "I'm really interested in us doing stuff from the '40s and '50s," she reveals. "Rock 'n' roll, torch songs and jazz songs". Beth's concerts like her records are musically bipolar in a positive way drawing from a diverse range of influences. At the Ryman Hart shifted to the keys for a sultry "Lay Your Hands" that was countered by a number of gospel tinged tunes including "Spirit of God" paired with an interesting "Chocolate Jesus" penned by Tom Waits. "Fat Man" also from the new release featured a feisty, funky groove. Throughout the night Hart shared some stories about her songs. The animated yet angry "Baby Shot Me Down" was a result of situations that her Mom experienced. Later the pensive "Sister Heroin" looked at a person's flaws in a forgiving and loving way. The band added accents to this emotional piece. Beth spent a lot of time behind the piano solo and with accompaniment. "You guys have been so warm to us," enthused Beth. The attentive Ryman audience rocked to the rousing tunes and listened quietly to the softer songs. Hart was both an energized performer as she danced to her muse and then moved the crowd with her subtler tunes. Hart was very appreciative frequently thanking her supportive fans. Beth had a commanding stage presence. Hart put her heart into her singing, baring her soul through personal, potent lyrics all belted out with passion. Hart shared with us that her father left the family when she was a kid. Like many children in a similar position she blamed herself for years, believing that she was not good enough. Beth mentioned that often her lyrics that deal with her fears take a longtime to unfold. "Tell Her You Belong To Me" written for her father was one of those songs but well worth the wait. On Fire On The Floor the track features guest guitarist Jeff Beck demonstrating that Hart continues to win the respect of her fellow musicians. Beth was excited to back in Music City a year after her triumphant debut at the Ryman. "God is awesome," declared Beth. "He gave me Scott". It was her husband who stood by Hart during her most harrowing days. In return she wrote a compelling love song. "My California" - filled with images of nature - had Beth close to tears as she completed it before her sweetheart came out to give her a hug. "St. Teresa" was another major moving moment of the night. "Leave The Light On" closed the set on a high note but the quartet was quickly back for the encore where they presented an arousing version of Led Zeppelin's "Whole Lotta Love" then finishing with the sentimental "No Place Like Home" played by Beth solo on the piano. Beth Hart with her band presented another triumphant concert at the Ryman. Hart is firing on all cylinders with the eclectic Fire On The Floor. She is touring in support of the new record. Hart's set was a mix of new and older material. Reflecting on the current record she states "I've always written all over the place," Hart notes. "I've got a lot of different artists I love from a lot of different genres, so as a writer of course I'm going to write in different areas like that." So check it out folks! 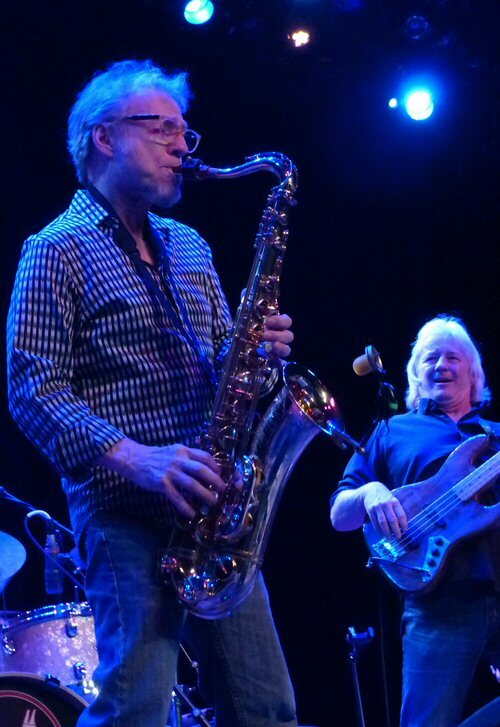 Opening for Beth Hart was Randall Bramblett an acclaimed solo artist as well as an in-demand songwriter and sideman. Among the musicians who have either recorded or performed Bramblett's songs are Bettye LaVette, Hot Tuna, Delbert McClinton and most notably, Bonnie Raitt, who opened her 2014 Grammy winner Slipstream with one of his tunes. In the 70's he was a member of the seminal jazz/rock group Sea Level. Randall from Athens, Georgia has toured with Gregg Allman, Widespread Panic, Levon Helm and Steve Winwood. Multi-instrumentalist Randall Bramblett from Georgia impressed in opening slot. Bramblett played keys and sax during his well-received set. Randall along with his talented team opened with "Driving to Montgomery" a fine example of southern storytelling. Next was a satisfying, soulful take on "Used to Rule The World". Their tune "John The Baptist" was catchy yet cool and closed with a short but succulent jam. Randall finished with a new song inspired by an experience at a Nashville recording studio that will be on his next record due out sometime in 2017. The Ryman Auditorium in the heart of downtown Nashville is known as the Mother Church of County Music but she continues to host a wide range of artists such as Beth Hart. Upcoming events at the Ryman include comedian Carol Burnett, Opry Country Classics, Norah Jones, Steve Martin with Martin Short and the legendary Fisk Jubilee Singers. 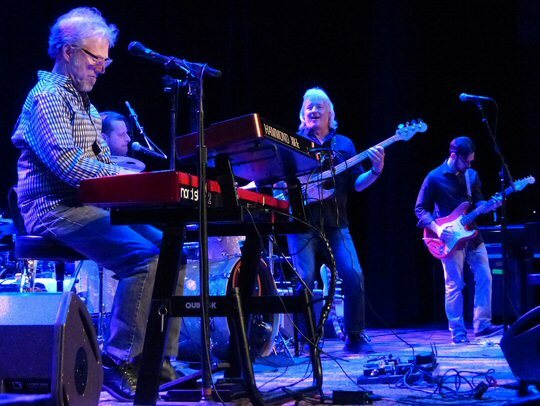 The Randall Bramblett Band brought their devil music to the Mother Church.